There has always been a plenty of interesting buses and coaches operating across the two south coast towns of Bournemouth and Poole. On this DVD programme we take a look at the scene starting in the early 1990s and up to 2015. To start with we are proud to present some archive video from the camera of Joe Ward showing Bournemouth Yellow Buses, then council owned sporting their all yellow livery with brown fleet names in 1990 and then updated with a blue trim in 1992 & 1993. The Wilts & Dorset buses are seen running in their smart deregulation livery of red, white and black. We also see National Express coaches still sporting the stripy livery introduced during the National Bus Company era. In 1993 Joe captures the ‘Routemaster Bournemouth’ services. This company operated a fleet of ex London Transport AEC Routemaster buses as well as former Bournemouth Corporation convertible open top Daimler Fleetlines, and open top Atlanteans from Portsmouth Corporation in a smart green and cream livery. The company was originally set up to generate income for a transport museum in Bournemouth, however Yellow Buses saw this as an attack on their routes and introduced ‘White Buses’ running a few minutes in front of the Routemasters! They repainted a number of elderly double deckers in an unrelieved white livery and also operated a former London Transport DMS! Routemaster Bournemouth ceased trading in August 1994. In the next part of this DVD programme we move to 2014 and to Bournemouth town centre and see how much has changed with the buses and their surroundings! Locations are Gervis Place, Exeter Road, Westover Road and Bath Road. Wilts & Dorset are now owned by Go-Ahead (Go South Coast) and branded as ‘more’ and Yellow Buses are now owned by French company RATP and carry a yellow livery incorporating reflective seashells. Its Volvos and Scanias that now ply the roads! From the town centre we are now in for a treat! Our cameras were on hand to see the arrivals and departures of preserved former Royal Blue coaches and associated coaches from companies of the erstwhile Tilling Group on their annual ‘Royal Blue Run’. On a beautiful sunny Saturday morning we record the 2014 event with our cameras at Queens Park off Poole Road in Bournemouth. From Bournemouth we move along the coast to Poole. Our cameras are placed at the bus station on Kingland Road on a busy Saturday afternoon in October 2015. 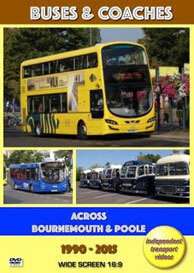 Here we see the day-to-day operations of Go South Coast and RATP Yellow Buses from Bournemouth. There are still a handful of buses still with Wilts & Dorset fleet names and in their final livery. On the day of our visit we see two ADL demonstrators in action, a single decker ADL200 and a double decker ADL400MMC. Regular members of the fleet include Wrightbus Eclipse bodied Volvo B7RLE single deckers, Optare Solos and Excels and double deckers in the shape of Optare Spectras, Scania OmniDekkas and ADL Enviro 400s, with all seen here. From Poole we return to Bournemouth for two visits in 2015, the first in October, the second in December. Filming takes place again at Gervis Place, Exeter Road, Westover Road, Bath Road and also Bourne Avenue. Both more and Yellow Buses are seen operating in service together. We see some members of Swanage depots’ Breezer liveried fleet of Scania OmniCity Optare Visionaire partial open toppers. A lot has changed in the 25 years covered in this programme, but there is still a lot to keep the interest going!